It is approximately 1 hr. 45 mins. to Izu-Oshima. There are several flights per day, but the time table is different depending on the date. It is approximately 6 hrs. to Izu-Oshima by passenger ship (usually over night). 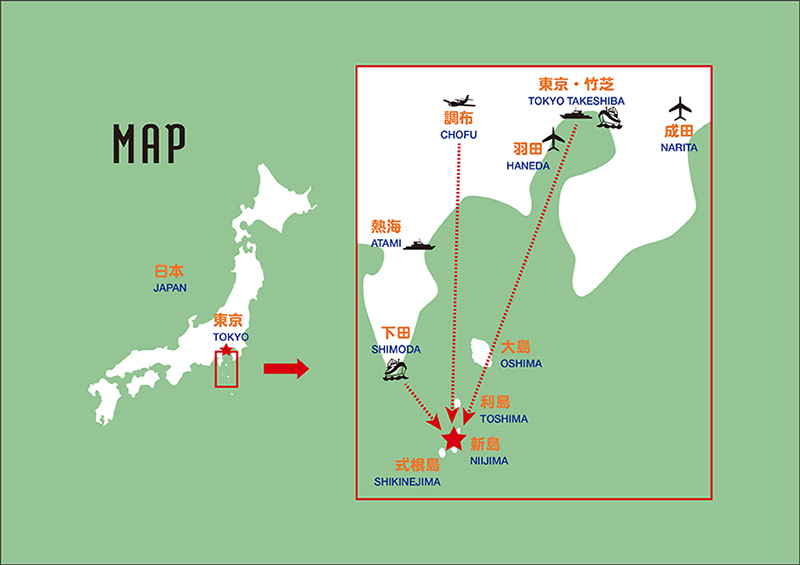 Departure is late at night and arrives in Oshima the next morning. From JR Hamamatsucho Sta. (The North Exit): It is about 7 mins. by walk. From Takeshiba Sta. of Yurikamome Line: It is about 1 min. by walk. From Daimon Sta. of subway: It is about 10 mins. by walk. Please check the timetable and fare on above site. It is approximately 45 mins. to Izu-Oshima. There are 1 or 2 flights per day, but the time table is different depending on the date. From JR Atami Sta. : It is approximately 15 mins. by bus (NO.7) and heading to Atami port/Korakuen. The fare is 230jpy. By taxi, it is approximately 10 mins. depending on traffic conditions. The fare is approximately 1,200jpy. Izu-Tokai Bus and Izu-Hakone Bus: Operated every 20 minutes between 8 am and 5 pm (0 minutes, 20 minutes, and 40 minutes per hour). It is 25 mins. from Chofu airport to Oshima airport. To Chofu Airport from Chofu Sta. (North Exit) of Keio Line: It is around 15 minutes (220jpy) by Odakyu Bus (click here to check time table), 1-2 buses per hour. By taxi, it is around 15 mins. and 2,000jpy from Musashisakai Sta. (South exit) of JR Chuoh line and Chofu Sta. (North Exit) of Keio Line. It is approximately between 2 hr. 20 mins. and 3 hr. to Niijima. It is approximately8 hrs. and 30 mins. to Niijima by passenger ship (usually over night). Departure is late at night and arrives in Niijima the next morning. It is approximately 3 hrs. to Izu-Oshima from Shimoda port by passenger ship and a flight per day. As it is a car ferry, if you traveling in Niijima by car are very convenient. Please make a reservation in advance. To Shimoda port from Izukyu Shimoda Sta. : By taxi, it is around 7 mins. and approximately 1,000jpy and it is around 20 mins. by walk.